1.3 Cardiopulmonary bypass: does size matter? Traditional cardiopulmonary bypass (CPB) techniques have suffered from a number of disadvantages including haemodilution, inflammation and post-operative bleeding. Minimised cardiopulmonary bypass techniques use developments in perfusion technology to significantly reduce foreign surface-blood interactions to make bypass simpler and safer. This important book reviews key developments and issues relating to this promising technology. Part one covers the broad range of CPB pathophysiology, including anticoagulant protocols, the impact of CPB circuit surfaces, optimal haemodilution levels, and the important issue of CPB-induced systemic inflammatory response syndrome. Part two focuses on the issues of the new equipment developed for mini-CPB, optimal myocardial protection protocols and CPB perfusate options. Part three discusses clinical issues, including patient selection, coronary and valve surgery protocols and, among others, paediatric patients. 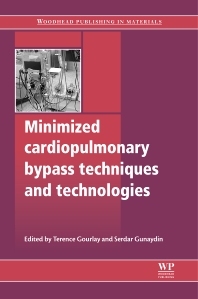 With its distinguished editors and international team of expert contributors, Minimized cardiopulmonary bypass techniques and technologies is a valuable reference for cardiac surgery teams and those researching this important technology. Clinicians, especially those concerned with cardiology. Serdar Gunaydin is Professor in the Department of Cardiovascular Surgery, K. Kale University, Turkey. Both are internationally-renowned for their research in innovative CPB techniques.